For my first assignment, I got to check out all the recipes that The Burnt Apple has to offer. I really enjoyed pursuing her recipe index as she focuses on healthy, budget friendly and recipes that can be worked into a busy schedule. She has 3 kids and a husband with special dietary concerns, so her focus on healthy and in a hurry. The recipe I chose is her Crockpot Breakfast Casserole since I don’t use my Crockpot near as much as I should. I loved the idea of waking up to breakfast already cooked for me, like having a butler. She has a plethora of recipes on her website to choose from, it was honestly difficult to decide what to make. Some others that sounded amazing: Sweet Potato and Black Bean Quesadillas, One Bowl Taco Salad, Pumpkin Chocolate Snack Cake, Under an Hour Cinnamon Swirl Bread, Lightened Up Texas Sheet Cake, Baked Chocolate Donuts, Crockpot Creme Brulee French Toast , a kid friendly section with things like Peanut Butter and Jelly Bites and even a craft and kid related portion (I definitely want to try the Cinnamon Pinecones because I’m ready for fall!). Check out all she has to offer! I really liked the idea of a Crockpot Breakfast Cassarole. Throwing everything in the night before, waking up on a Sunday morning and not having to do anything at all but serve it and eat it. We have a small family so the leftovers can be eaten refrigerated and eaten throughout the week. I also appreciate a breakfast meal that is gluten free. This recipe is perfect for school nights, or when you have family in town really any occasion. It’s pretty versatile as well. Next time I think I’ll make it with cooked sausage and put the casserole inside a tortilla for a easy breakfast taco. Side note, this made me completely realize I need to utilize my Crockpot more. In a bowl, whisk together the eggs, milk, mustard, garlic powder and garlic salt and set aside. Layer half of the potatoes in the bottom of the crockpot. Generously salt and pepper the potatoes. Layer half the meat, half the onions and half the cheese on top of the potatoes. Repeat another layer. Pour the egg mixture from the bowl evenly on top of the potatoes, meat and onions. and it should seep down into the potatoes. Put the crockpot on the low setting. For refrigerated hash browns, cook for 6-7 hours. For frozen hash browns, cook for 8-9 hours. Casserole is finished when eggs are set. Serve with salsa if desired and fresh fruit. Make sure to check out all of the recipes from the Secret Recipe Club swap today! I’ve been a member for ages, and love it! Thanks Sally! I’m super excited to be a member and meet new blogging friends! Welcome to the Secret Recipe Club! I love that you got put in the same group as me! 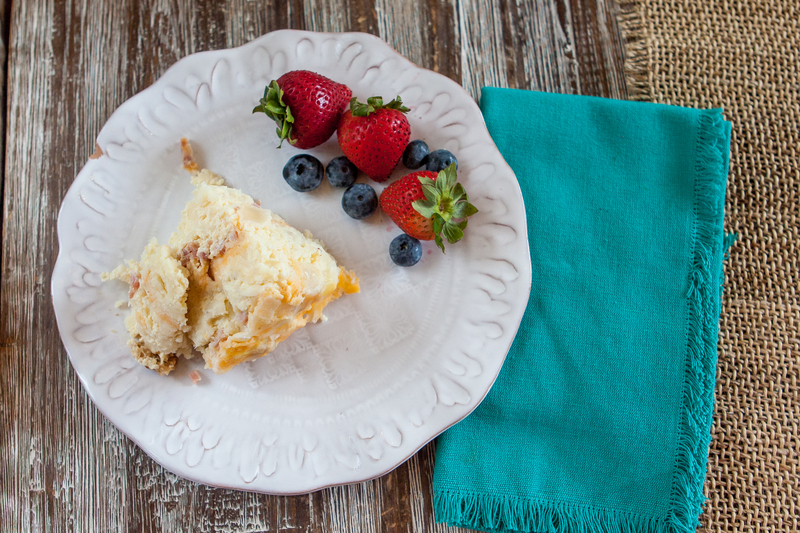 This breakfast casserole looks delicious. I definitely need to work on pulling out my crock pot more. Thanks Tara! So excited to be in the same group!!! Hopefully we get each other soon! Welcome to SRC, and to Group D!! 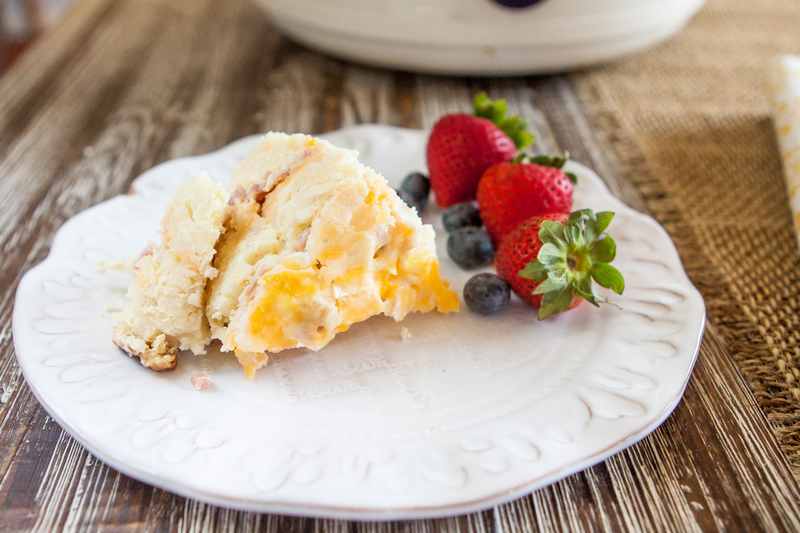 I love anything slow cooker and this breakfast casserole was such a great pick!! Thank you Karen! I’m so excited to be here. I really enjoyed the casserole this week! Looks delicious! That it cooks overnight really is handy. Just wake up to breakfast! Great post. Thanks Sue! It was perfect! I need to use mine more! I used to plan my weekly menu with at least one crockpot meal and I have really fallen off the wagon of doing that :/ I have made breakfast casserole in my crockpot before and it’s AMAZE!!! Welcome to Secret Recipe Club – so excited to have you in Group D! Happy Reveal Day! Thats a great plan! We do Blue Apron 3 nights a week, and I need to try and do once a week crockpot. I know I’ll make this recipe again! Thanks for the warm welcome! I’m so excited to be a part!! Welcome to Group D! That’s so exciting that you’ve joined us! This casserole looks amazing! There’s no risk of anyone being hungry after eating it! Thanks so much Christine! I’m so excited to be here. We definitely weren’t hungry, it was delicious!! Welcome to the club Amber. Great choice for your reveal day. I love breakfast casseroles but so rarely plan ahead to make them. Love that it can be made in a crock pot now! Breakfast casseroles are always a life saver during the holidays, now it’ll be even easier using the slow cooker! Welcome to the group! I have been eyeing breakfast casseroles in the crockpot for the last few weeks. We have a bunch of guests coming next month and I think this is just the breakfast we need. Great pick!